The arrival of Wimbledon always marks start of summer for me; it’s not just the tennis but it’s also the time that I notice all those ‘Pick Your Own’ signs popping up in the countryside, advertising the start of the fruit season. In fact, we picked our first strawberries at the weekend and we’ll usually visit another three or four times throughout the season – it’s just so nice to spend a couple of hours in the middle of nowhere with just my family and a cardboard punnet for company. 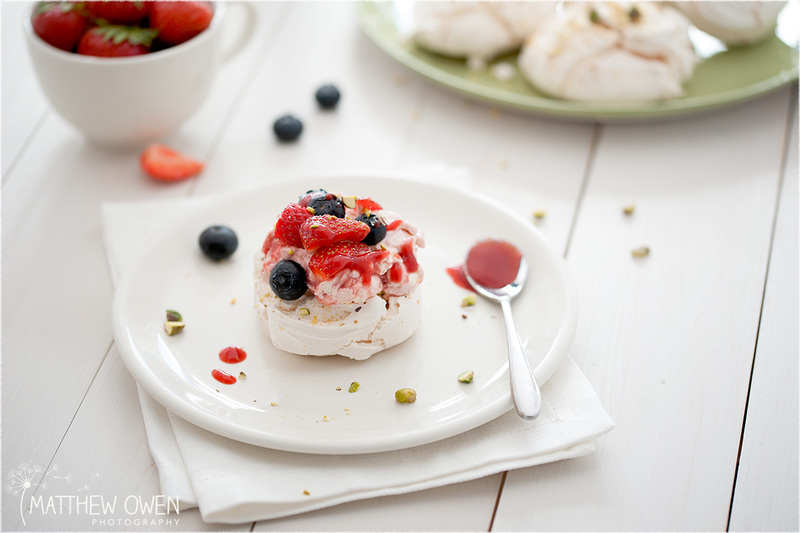 Fruit doesn’t get tastier than this (just ask the children while they’re picking it!) and while it’s great to be supporting local business, we always buy far more than we intend. 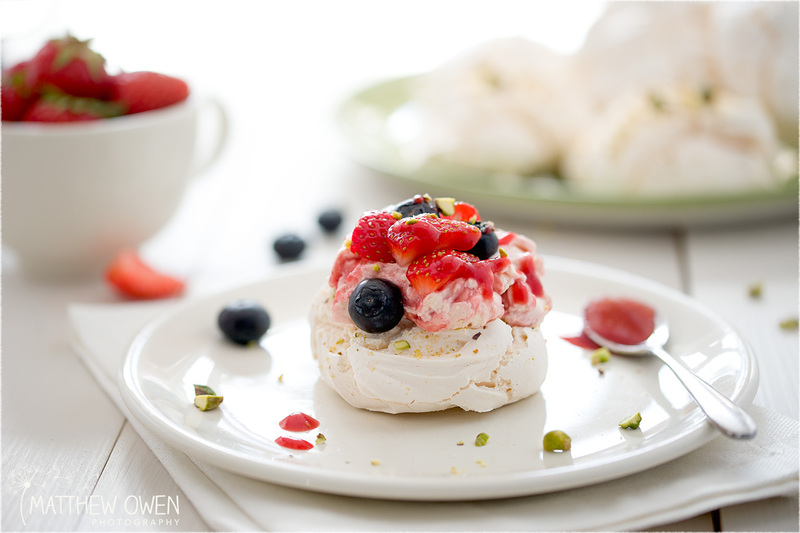 So instead of making ice-cream or fruit salad this time, we took inspiration from the tennis at Wimbledon and transformed the humble strawberries and cream, into pistachio meringues with a strawberry sauce fool. 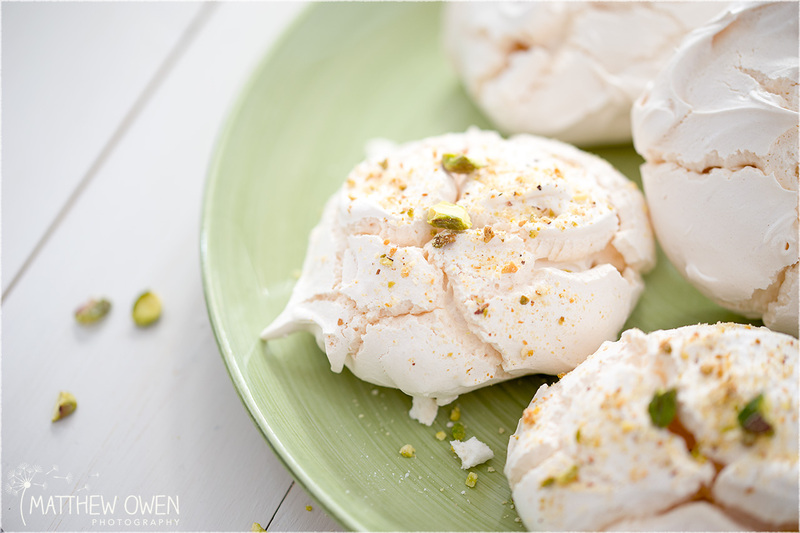 If you’re new to meringues, there’s a great recipe on the BBC Good Food website that’s perfect for fluffy, light results – you can’t go wrong with a basic meringue but if you want to add the pistachios like I did, just fold them in towards the end (or scatter them over the top). 50g of finely chopped pistachio goes a long way and be sure to save some to decorate. But here’s the surprise ingredient: white wine vinegar! It’s essential for wiping down your bowl and whisk to get everything really clean, but half a teaspoon added at the beginning helps to stabilise the egg whites. This prevents your beautiful, glossy mix from turning into the kind of foam that wouldn’t be out of place in a bubble bath. You’ll need to hull and roughly chop 400g of strawberries, and add to a pan with 50g of caster sugar and a splash of water. Once it’s gently simmering away on a medium heat, keep stirring for 10-15 minutes until it thickens. The strawberries should soften and start to break down, but you could always give them a little gentle encouragement with the back of a wooden spoon. Once it’s looking much thicker, pop it all in a blender and strain through a sieve into a separate bowl to cool. That’s your sauce finished, but make sure the children don’t see it otherwise you’ll be soon making a second batch! Add 400g of double cream to a large bowl, sieve in 50g of icing sugar, and whip until it’s firm – you’ll know it’s ready if soft peaks form when the whisk is removed. This takes no time with an electric mixer but be prepared to feel the burn if you’re doing it with a hand whisk! Once your strawberry sauce has cooled, gently fold in about three quarters making sure to keep back for decoration. 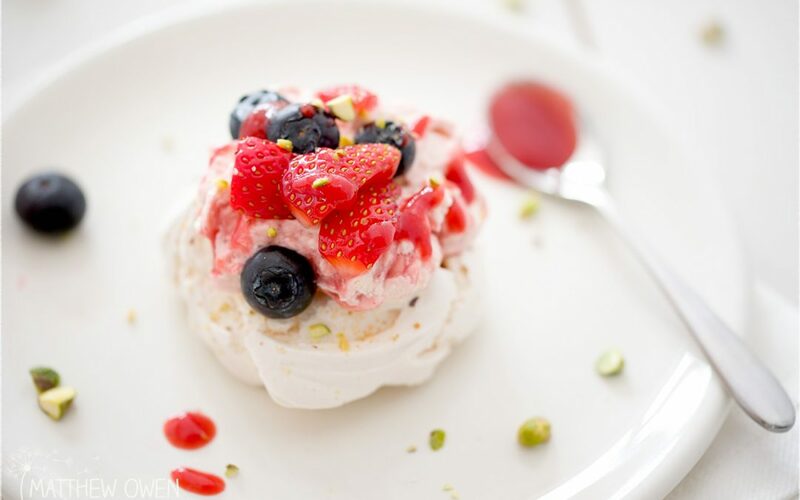 Now just add a couple of generous dollops of fool to your meringue, decorate with your favourite seasonal fruit and remaining chopped nuts, and drizzle with a little of that gorgeous strawberry sauce.